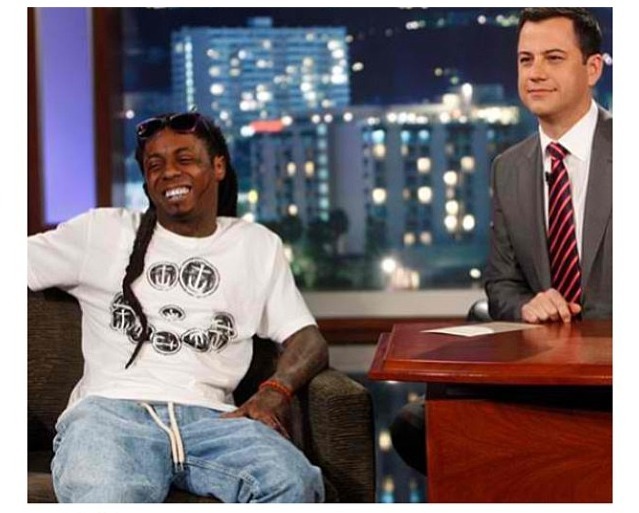 Lil’ Wayne made an appearance on Jimmy Kimmel Tuesday night. Wayne was there to promote his new album, I Am Not A Human Being II, but also opened up about his recent medical scare with multiple seizures and his plans on retiring to spend time with his children. He also talked about the Miami Heat rant during All-Star Weekend where he claimed that he slept with Chris Bosh’s wife, Adrienne and whether or not he was actually banned from Heat games. He doesn’t actually say no about sleeping with Adrienne Bosh, but he does act like he didn’t remember making the remarks. Even though Wayne was touching on some serious issues, Jimmy Kimmel didn’t miss the opportunity to make light of the situation with a few jokes. Like claiming that he was at Lil’ Wayne’s side the entire time he was in the hospital and when Lil’ Wayne mentions his daughter’s new book but doesn’t know the name of it… Jimmy hopped all over that. It is a [medical condition] that I’ve been dealing with for my whole life. We’re so use to it happening, so my doctors prepped all my homies and now they know. I didn’t get banned because they told me I’m allowed back whenever I want. I don’t think they want me there so I’m not going to make it hard on either of us. I said that????? […] I was too turnt up that night. I was a little too turnt up. Yes I am. it’s very true. I want to retire after The Carter 5, which I hope will be my last album. My next album isn’t The Carter 5 […] but after The Carter 5, I hope I can retire.